You love construction sites and equipment? 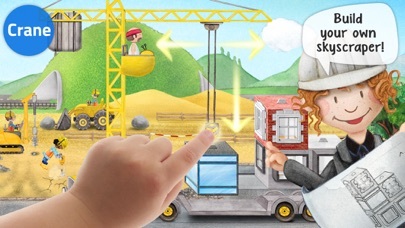 On our construction site, you can operate the crane, the digger, the bulldozer, the wheel loader, the tunnel drill and many other machines yourself and control them with your finger. And best of all: you can customize the look of the little builders individually. • Ideal for children aged 2-6. 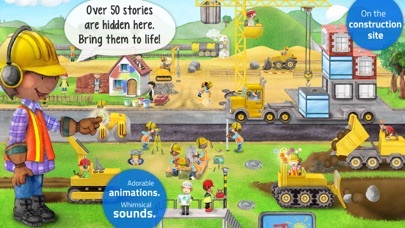 • 12 construction machines and over 50 interactive stories to discover. ▸▸▸ YOU’RE IN CONTROL – of all machines: • Great feature: You can freely play with all machines, control and operate them. 1. Build your own skyscraper with the crane 2. Excavate a large pit using the digger 3. Load and unload the large dump trucks 4. Build your own road – with three machines: first apply the asphalt, then roll it and finally paint it 5. Drill a tunnel through a large mountain 6. Move heavy rocks out of the way using the wheel loader 7. Paint a house in your favorite color (or in a blend of many different colors) 8. Search for water everywhere using the water drill 9. Break up the ground with the jackhammer 10. Transport rubble off the construction site with the tipper and much, much more ... ▸▸▸ STYLE BOX – give your builders an individual look: • Striped or checked? 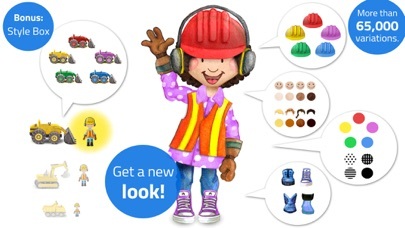 You can dress the builders as you like: hair, face, helmet, shirt, pants, shoes – everything can be customized individually. • Prefer green to yellow? You can easily change the color of the machines! • Blond or brown, curly or with a pigtail? However you like it! • A total of over 65,000 variations of machines and builders are possible. ▸▸▸ WHAT ELSE will you find on the construction site? • As always, we’ve hidden many little stories for you to discover: • Lots of fun for all ages with more than 50 interactive, animated adventures: 1. Help the architect to read the plan. 2. Drive the train through the self-drilled tunnel 3. Oops, the mason has bricked up the door ... what will you do? 4. The bird is annoying the crane operator ... 5. Let the builders take their break. 6. Help the roofer to cover the roof. 7. Switch on the radio and watch the funny builders' dance! > And many other adventures await you ... There is so much to discover, what are you waiting for? ▸▸▸ SURPRISE – as always: Paint your own town sign! ▸▸▸ GET IN TOUCH - with us We want to keep hearing from you so don’t be shy and keep on telling us what you think about our apps! What do you want to see next? Share your thoughts with us @wonderkind on Facebook. This app is so fun. I enjoyed drawing the symbols on the signs, and doing all the work, and I enjoyed painting the house and building the apartment building using the crane. You should play this app to do what I did. 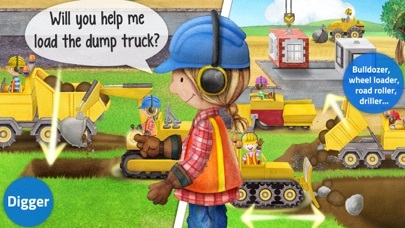 This is a great app for toddlers that love construction trucks! I do wish it was a bit cheaper as I feel he might get bored with the one scene available... there's a lot to do within the one scene, but don't see it holding his attention for more than a month. Hopefully more will be added! My little guy loves this game and has for over a year. He loves trucks and cars, so the construction equipment is especially fun for him. Fantastic app. Well designed and simple to use. My children and I enjoy playing this game. My 4yr old nephews absolutely love this app! The animations & sounds are adorable & keeps them entertained. It has so much for them to do & they don't have to ask for help while playing it. 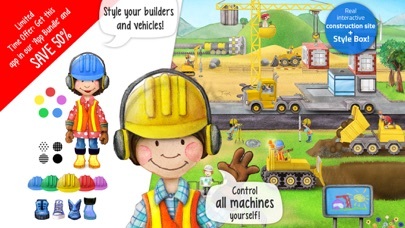 I highly recommend this app for kids especially for the little construction lovers! A really great game for small children or even kids. I like this game because there is no violence like in other games, a very huge plus for that! There are some quirks with the game but overall I think its very decent. It's a wonderful game for my kids, but the arabic written form of words and phrases are read from left to right. Scrambled. It should be from right to left. Fix it please.